Until perhaps 10,000 years ago, Australia and New Guinea were part of the one landmass known as Sahul. As a result, the two islands share a great deal of flora and fauna. They are; however, very different in regards to fertility levels. Because of environmental differences, by the time of the first European contact, the indigenous people of New Guinea had developed farming communities and had domesticated animals such as pigs. The indigenous people of Australia were hunter gatherers. They did not have pigs, but they did have dogs. From the 15th century onwards, a variety of European countries made contact with PNG. In the late 19th century, Holland, Germany, Britain and the colony of Queensland were all in competition for formal ownership over the land. After Federation, Britain entrusted Australia to manage its claims over Eastern New Guinea. 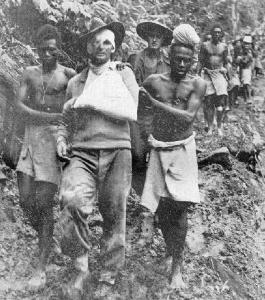 During World War 1, Australia assumed occupancy over German controlled New Guinea. After the war, it was given a mandate to administer Papua New Guinea by the League of Nations. During World War 2, Japan invaded PNG and almost pushed the Australians out. After defeating the Japanese, Australia resumed control. A few Papua New Guineans then started asking for independence and found that the Australian government was very receptive to their requests. In 1975, PNG gained its independence from Australia. After gaining their independence from Australia, some tribes started fighting for independence from Papua New Guinea. The biggest bloodshed occurred on the island of Bougainville. It is estimated that 20,000 lives were lost from 1988 to 1997 in the independence fighting. In some ways, Papua New Guinea is more of a collection of tribes than a true country. 97 per cent of of PNG land is customary title. Each tribal group pushes its own interests instead of working for the interests of the country as a whole. In that regard, PNG is one of the most multicultural countries on Earth, with over 850 indigenous languages. Reflecting the dominance of tribal identities over national identities, winners of elections often receive less than 15% of the vote. Corruption is endemic because tribal relationships rein over the rule of law. Endemic warfare has also influenced tribal practice. To ensure that war could continue in a sustainable fashion, tribes needed to create customs that allowed them to maintain relationships with neighbouring tribes even while they will fighting each other. Sometimes this allowed warfare to be regulated. For example, one tribe would be in a state of spiritual decline until they killed an individual from another tribe. After killing the individual, the body would be returned to the tribe so that it could have death rites performed. The second tribe would then be in a state of spiritual decline until it could kill a member of the first tribe. The process of killing one person at a time had existed for as long as everyone in the tribe could remember. Both tribes thoroughly enjoyed their constant state of war. It helped maintain group identity and perhaps controlled population. Unlike Papua New Guinea, Australian culture is not tribal outside of the Aboriginal world. Furthermore, there is hostility to the idea of a big man whose thinking goes unquestioned. This is probably a Convict legacy. For a variety of reasons, freed Convicts saw themselves as equal or superior to their ex-masters. Their ex-masters didn't agree, which in turn created a social schism that has never been resolved. Even today, the word "elites" is used as an insult and elitist thinking is widely deemed to be defective thinking. Those who express elitist thinking feel disconnected from the group and complain of a "tall-poppy syndrome." Many countries around the world owe their national border to decisions made by foreign powers. Nevertheless, they have steadfastly refused to allow minority groups within those borders to leave and create countries of their own. Unlike these countries, Australia freely let Papua New Guinea to become independent. Perhaps Australia let Papua New Guinea go because a cost benefit analysis concluded that the provision of welfare, health and education services, or controlling tribal conflict, would have cost more than could have been recovered by exploiting Papua New Guinea’s resources. Furthermore, the provision of services and the implementation of the rule of law would have led to the same kind of international condemnation that the Chinese government is experiencing as a result of its policies in Tibet and Indonesia is experiencing in West Papua. Specifically, the Australian government would have been accused of cultural genocide. Another explanation for letting PNG go was that Australians were just too apathetic too care about how large or small their land mass is. Hypothetically speaking, if a state wanted to leave Australia, perhaps few Australians would consider the issue worth fighting for. Evidence of this comes from Western Australia's aborted attempt to leave the federation in the 1930s. 68 per cent of West Australians voted in favour of seceding from the Commonwealth of Australia. However, they needed permission from the British Parliament before they could officially become a new country. Meanwhile, Australia's Federal Parliament was arguing that Britain should not interfere in Australian politics. The end result was that Britain never made a decision and Western Australians decided it wasn't a big deal anyway. Such was the apathy towards the potential loss of WA, today, most people in the eastern states don't even know the vote occurred. While Australians are generally apathetic towards the independence of themselves and others, Papua New Guineans are much more passionate. As a result, Bougainville style conflicts are common. Papua New Guinea's national Day is September 16 1975. This is the anniversary of independence from Australia. Australia’s national day is Australian Day on January 26. This is the anniversary of the first fleet of criminals landing in Sydney in 1788. Quality of life is subjective. In PNG, the indigenous people have a strong culture and identity. Furthermore, because 97 per cent of land is native title, members of the tribal groups have potential economic resources as a birthright. They do not need to share these resources with the country as a whole. On the downside, life expectancy is only 55 years for men and 60 years for women. Economic and educational opportunities are limited, and tribes are constantly in conflict. The type of conflict seen in Bougainville is an extreme version of a PNG-wide problem. Competing interests have rushed to conflict in a way that has ensured both sides lose. Life expectancy for Australian Aborigines is 58 years for men and 65 years for women. 70 % of Australia's Aborigines live in cities. Although most of these people don't have tribal land, they have guaranteed access to education, welfare, housing and health services. Australia's rural indigenous people usually have tribal land; however, they often struggle to access the educational, housing and health services of the cities. It is within their means to walk off their land and live in the cities, but this would come at the cost of their tribal identity. Papua New Guinea is one of the few countries outside of Australia to play Australian football. In 2004, there were almost 10,000 Aussie Rules players in PNG (including 1,920 senior players across 64 clubs). Papua New Guinea is also the only country aside from Australia where rugby league is more popular than rugby union. In the last few decades, it has taken Australian football’s title as Papua New Guinea’s national sport. 50% of the population under 20 play rugby league. "They carried stretchers over seemingly impassable barriers, with the patient reasonably comfortable. The care they give to the patient is magnificent. If night finds the stretcher still on the track, they will find a level spot and build a shelter over the patient. They will make him as comfortable as possible fetch him water and feed him if food is available, regardless of their own needs. They sleep four each side of the stretcher and if the patient moves or requires any attention during the night, this is given instantly. These were the deeds of the "Fuzzy Wuzzy Angels"-for us! " Today, many Australians travel to Papua New Guinea to walk the track. It is seen as Australia’s only battle that involved the defence of Australia. It is also seen as a battle that involved struggling against extreme adversity but never giving up. For Papua New Guineans, the track doesn’t inspire the same passions as it does for Australians. Perhaps this is because war is more common for Papua New Guineas than it is for Australians. Tribal conflict has existed has long as people have been on the island and Japan was not the first foreign power to invade. As a consequence, it is seen as more of a tourism scheme. Some of the different attitudes were exposed in 2007 regarding a proposed mine that could damage the track. The Australian government pressured the Papua New Guinean government to ban the mine because it could damage the track. Local Papua Guineans reacted by closing the track to tourists. They wanted the mine to proceed so that they could get a slice of the royalties. They then accused Australians of wanting them to live in poverty for ideological reasons. People find it easier to break the law when they have some kind of rationalisation that makes breaking the law morally acceptable to them. Like it is in China, Papua New Guineans have strong family values that are often expressed in expectations that a rich family member will share their wealth or family member in the bureaucracy will source jobs for other family members. Discuss whether moral expectations to help the family may help individuals rationalise breaking the law. Debate the following question by weighing up how you value cultural identity versus individual economic advancement. 1.Papua New Guinea has a great deal of natural resources that it has not been able to exploit and equally share due to tribal conflict and corruption. Most people in the country would be better off if the tribes gave up their native title so that it became crown land owned by all.